Next Mens L Khaki Jacket Used Good Condition. Hood fits inside zipped collar. Zip front with press studs. Inside 1 pocket. Outer 4 pockets with zips. (63% WOOL BLEND). - Collar = XL - fits around the 46” chest. Unsure about an item, or need extra information?. - Pit to pit = 24”. Dark Tan Leather Jacket. Brad Pitt - Fight Club style jacket. Chest- 40'-----length - 36'------underarm cuff - 17'. fabric--60%wool/40%polyester. Says size S on the label. SUPERDRY NAVY PAINT SPLATTER DESIGN T SHIRT. COCA COLA T SHIRT. NEXT NAVY BLUE COTTON BLEND JACKET, FULLY LINED. CEDAR WOOD STATE WHITE T SHIRT. ALL SIZE S. ALL GREAT CONDITION. Next 100% Pure New Wool Harris Tweed Jacket Classic Blazer in Herringbone Weave. 3 outside flap pockets and one breast pocket. Chest 42 in. Regular Slim Fit. One back vent. Chest- 46'-----length - 38'------underarm cuff - 17'. fabric--60%wool/40%polyester. Says size L on the label. NEXT SIZE 46 TAILORED FIT WOOL FULLY LINED TWEED/HERRINGBONE JACKET. 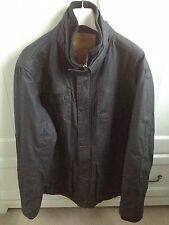 Fab NEXT Men's Lightweight Cotton/Nylon Hooded Jacket size XL / Chest 44 - 46"
(Immaculate condition, looks fab on :). Fixed hood with drawstring fastening. 2 side zipped pockets to front and 1 buttoned chest pocket. 28" shoulder to hem. Lightweight, unlined. 25" pit to pit. LENGTH DOWN BACK: 31". SLEEVE LENGTH (SHOULDER SEAM TO CUFF): 25.5". 39-41" CHEST. Mens New Next Grey Collared Coat Size L. Slight herringbone in material zip fastening with button fastening over. Pocket detail also, lined and material is wool. Jacket purchased but not worn, has been kept within wardrobe, still brand new. Just past hip length (dependent on height). Please note all items from smoke & pet free home. Size: Label size: 42 - UK estimated size: 42 L. Weight: 900 gr. GREAT JACKET IN GREAT CONDITION AS ONLY WORN ON A HANDFUL OF OCCASIONS. Men’s next raincoat, lovely coat & great quality. Pbought last year, paid £75. Worn to the car and back! Too big for me, if someone has this coat in small I’d gladly swap it! Regular Fit. Fully Lined. Multi Pocket Front. 25" (pit to pit), 27 1/2" (shoulder to cuff), 29 3/4" (collar to bottom hem). NEXT BLAZER. Material: 100% LINEN. We use grading scale from7 (excellent/as new) to1 (poor). Condition in out of 7 scale:6. always ready to discuss and find a way of any unexpected issues. Next Mens Coat Size Large . Condition is Used. Dispatched with eBay delivery – Shutl 1 day. Coat was worn only 2 times. Very good condition from pet and smoke free home. This is a navy hooded gilet with full zip front, 2 x zip side pockets, 1 x zip breast pocket, 1 x Internal button down pocket and a full zip fastener to centre closure. Machine Washable 40°. Size on Label : Extra Large. THIS IS A STUNNING WINTER GILLET FROM THE NEXT OUTDOOR COLLECTION. THIS STYLISH PADDED GILLET WILL KEEP YOU VERY WARM IN COLD CONDITIONS AND IS A SUPERB ITEM. For sale is a NEXT mens blue denim lightweight zipped jacket UK size L (46 chest). It’s in good used condition as only worn it a few times. Grab a bargain, thanks. • A great warm winter coat. Next Winter Coat. • Warm comfy hood attached. • Chest 50". Children's Clothing. • Size large. Fashion Accessories. Add to Favourites. In overall great used condition with some distress on the hem and ends of collar but not an issue. Recommend to wipe clean around graphic rather than machine or hand wash. Two front slip pockets. Spring/Summer. 40" waist. 27" length from shoulder to hem. 27" sleeve length from shoulder seam to cuff. 21" pit to pit. 42" chest. Not lined and not stretchy. Any questions please ask. Thanks. Chest - 46 in. (pit to pit 23 in.). Zip & Button. Size: Large. Real Genuine Leather Jacket. Low start so grab yourself a quality item at a great price! Two press stud snap flapped chest pockets. Press stud collar fastening. Size Large. Across back (shoulder seam to seam) 20" 50cm. NEXT Black Waistcoat with Dark Blue back/lining. BNWT - RRP £29. Size: 44 Regular. For sale is a used gents jacket. It has check or square pattern quilted. Colour - Black. (not the half square hem of the jacket, but located on the first full square row (4th square)from the bottom). STYLISH AND MASCULINE. wear with a jumper and jeans for that youthful man about town look, or with a crisp shirt and tie for the more formal occasion. 2 inside pockets. Single breasted 2 buttons. Good used condition. Material isn't suede but has that suede feel. Zip closure button closure. 2 inside zip pockets. Only worn once so in good condition. 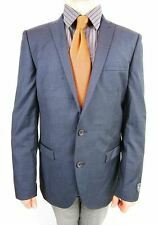 Mens Next Blue Tweed Style Jacket Size 36R Tailored Fit. Jacket has been worn but is in very good condition. Dispatched with Royal Mail 2nd Class.